Itemis-jas-84.32.01 - Scenery in the Miette Valley, Jasper National Park, Alberta. Itemis-jas-84.32.02 - Scenery in the Miette Valley, Jasper National Park, Alberta. 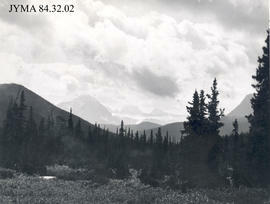 Itemis-jas-84.32.03 - Scenery in the Miette Valley, Jasper National Park, Alberta. Itemis-jas-84.32.04 - Scenery in the Miette Valley, Jasper National Park, Alberta. Itemis-jas-84.32.05 - Scenery in the Miette Valley, Jasper National Park, Alberta. Bob Jones served with the Park Warden Service in Jasper (l940-l945). 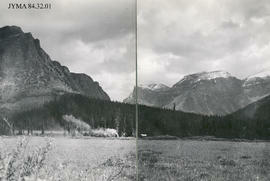 Consists of an album of photographs collected by Bob Jones of World War II Habbukuk Ice Boat experiment, Jasper National Park Back Country Warden Cabins, Park Warden fire fighting equipment, Fire Lookout cabins. Back Country scenes of Jasper National Park. Gift of Bob Jones, Canadian Parks Service. Inventory available with the album.